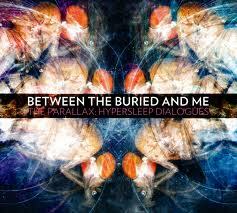 The Parallax: Hypersleep Dialogues (2011) is an EP from the metal band Between the Buried and Me. Their first release through Metal Blade Records, itâ€™s a science fiction death metal sort of concept album. And no, genre convergences like this arenâ€™t very common if that sounded weird. Science fiction and heavy metal fans both share ravenous devotions, often with a mutual interest in each, but a cross-over album like this is difficult to pull off. Something about the idea just reeks of geeky inaccessibility. Parallax doesnâ€™t blow it though. The album is a total cornucopia of different musical stylesâ€”metal and beyondâ€”in three tracks which range from lengths of eight to eleven minutes. At the core here musically and lyrically weaves a dark and aggressive sound, with time signatures and structural transitions which evoke wonder at how itâ€™s possible for five musicians to coordinate something so layered and complex. A huge range of musicianship is pretty much a staple of Between the Buried and Me. This band somewhat falls under one of the few sub-genres within the metal genre that actually matter as a separate designation. Progressive heavy metal, so called, absorbs just a huge variety of musical influence. Itâ€™s got the best shot at bringing non-believers of metal into the fold, rather than making them brush it off as the kind of music where the singer is screaming incoherently behind one-dimensional guitar work. Admittedly, Tommy Rogers is hard to understand a lot of the time, but he has some serious vocal range. He sounds like heâ€™s standing on top of a mountain announcing the apocalypse with everything exploding around him, but then can shift into an angelic croon as he works some out-of-nowhere stuff on the keyboard. It synchs flawlessly with the ambience created by the other musicians. The album starts with an orchestral intro and shoots off into magic. Itâ€™s got heavy, complexly timed bring-the-pain riffs, beautifully peaceful melodies (with those vicious and soothing vocals to compliment each, respectively), plus a weird polka digression, some jazz-fusion gorgeousness, and just a bunch of other intricacies that will leave listeners in awe. One of the coolest things about the different seamless transitions (which the band totally pulls off in live shows, by the way) is reflected in the lyrics as the story unfolds. With help from the lyrics sheet, the storyline of Parallax follows two characters, designated as Prospect 1 and Prospect 2. They live in different worlds, and big existential shifts are happening in their lives. The first track, â€œSpecular Reflection,â€ shows our narrators attempting to ascend from unconscious states and struggling to pin down their separate locations as they reflect on their confusing pasts. â€œAugment of Rebirthâ€ shows the characters transcending their current situations and acknowledging that they must move forward and recreate themselves, or their worlds, or perhaps both. â€œLunar Wilderness,â€ the final track, has them awaking to embark on new journeys, with Prospect 1 seeming to be more accepting and Prospect 2 dwelling more on the realization that his/her old world and life are dead. Their inward views of Self versus external observations are sometimes tough to follow, but this album is only the first part of a longer album to be released by the band in the near future. No doubt itâ€™s a complicated story requiring effort from the listener/reader. When taken time to explore though, the textures and depth get really far out there and greatly compliment the music. For instance, the word â€œParallaxâ€ denotes a theoretical principle. It regards observing an object from different sight lines to gain different perceptions and understandings of it. This principle is used in astronomy to measure distances through triangulation. Parallax is also used metaphorically in stories with multiple narrators who exist on the same timeline. A Slovenian philosopher, Slavoj Å½iÅ¾ek, wrote about this in a book called The Parallax View. He presented that an object being perceived from one viewpoint will take on new properties when perceived from a different viewpoint. If an object can reveal alternate perceptions of itself, the viewer of it conversely becomes an object of the original one, and is thus incapable of a complete understanding of its own place in the grand scheme of reality due to its own limited subjectivity. Keeping Å½iÅ¾ekâ€™s statements in mind, the band has stated that the second installment of the story will pick up with our two characters meeting up in order to understand their purpose in the universe. Pretty heavy, in a different sense of the word. Between the Buried and Me is like the David Foster Wallace of metal. Their guitarists will probably go down in history as two of the greatest. Itâ€™s just remarkably different than what anybody is doing right now. The odd digressions and beautiful melodies weaving into an ominous and chaotic story are wildly creative, and not just for a metal band. Non-believers should feel more than welcome to have a listen. Or take a look, so to speak.